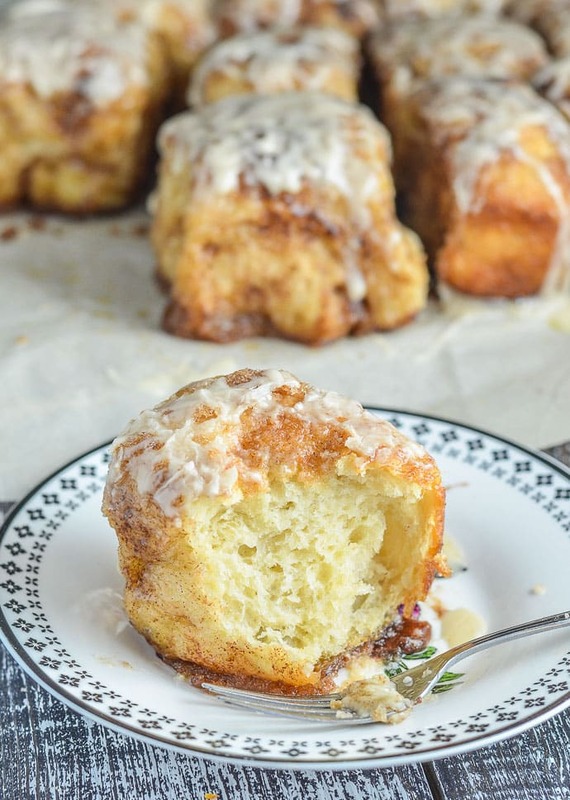 No Knead Cinnamon Pull Apart Bread. All the sticky deliciousness of cinnamon rolls but with none (and I really mean none) of the effort! It needs about 10 minutes of hands on time and will totally fit around your schedule. It can be ready in a couple of hours or you can leave it to rest in the fridge overnight & bake it up in the morning. It makes THE perfect brunch! 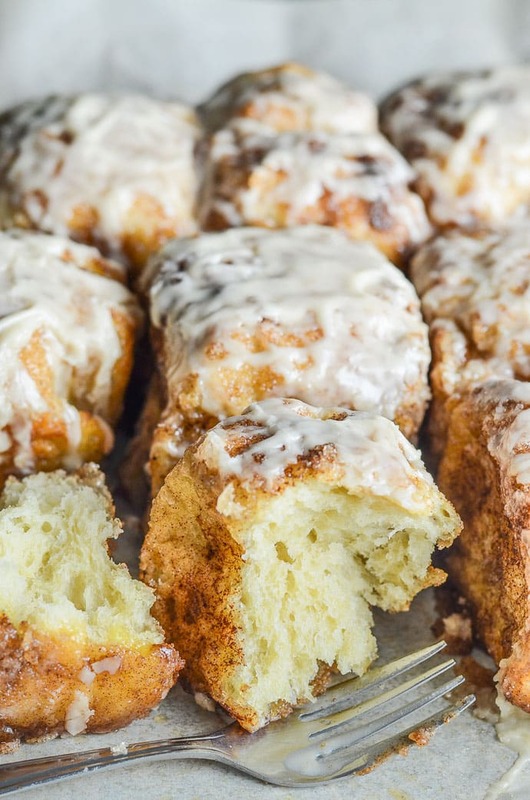 This No Knead Cinnamon Pull Apart Bread is just incredible and what makes it even more incredible is that it takes literally zero effort. You do not have to knead it at all. Not even once. It does all the hard work itself while you do quite literally nothing. If you have made my No Knead Focaccia Bread you will know how easy and how good it is. 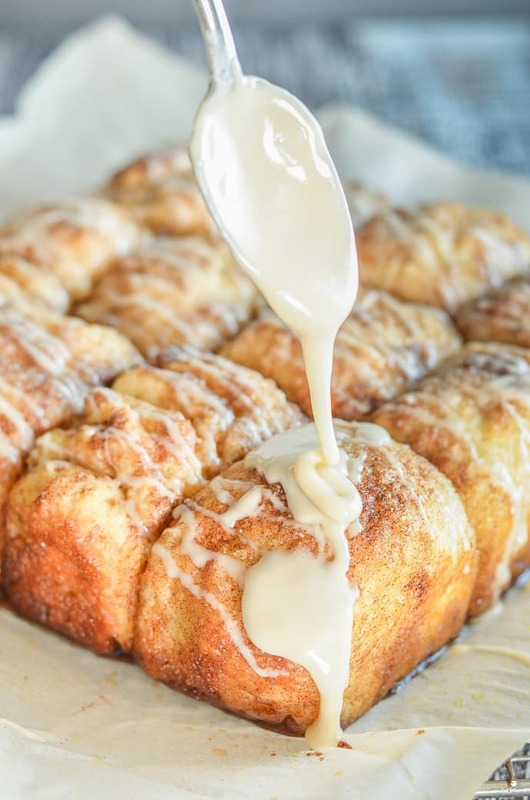 Well, this No Knead Cinnamon Pull Apart Bread is adapted from that recipe and is even better because it involves lots of cinnamon and sugar ???? Perfect for those of you with a sweet tooth like me! 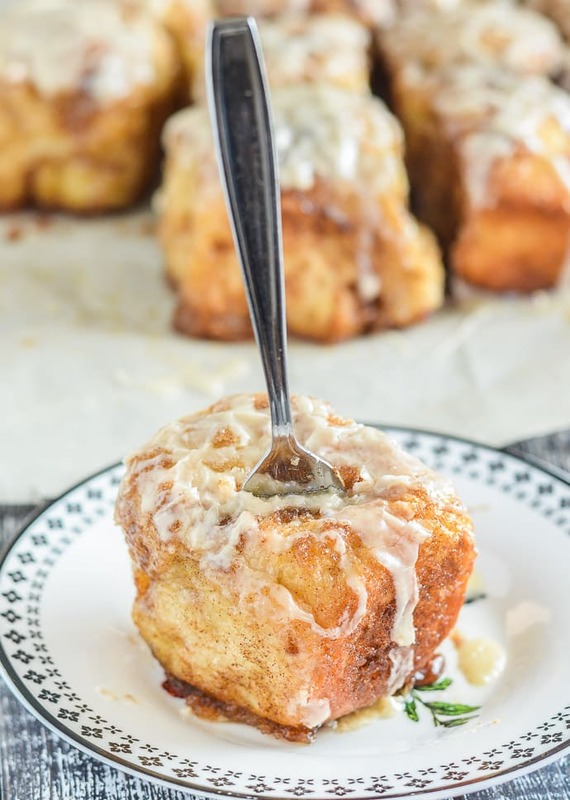 It’s kind of a cinnamon roll x monkey bread hybrid and is absolutely perfect for brunch. If you plan to be up early you can mix it up that morning. All it needs is 2 hours to do it’s stuff but that time is all hands off. Or you can mix it up before you go to bed and leave it in the fridge all night for anything from 8 to 10 hours. It’s such a flexible recipe which is a major part of it’s appeal. I have made a step by step video so you can see exactly how it’s made. You can find it below (just above the recipe). This easy bread recipe is virtually no-fail. If you follow my instructions exactly you will get great results. It is made in just a few easy steps (see my video below). First you mix the dough in a bowl with a spoon, or in a stand mixer if you want to, then cover and leave it to do it’s thing for anything from 2 – 10 hours. You can go put your feet up or sleep! Then you pull off lumps of dough, dip them in melted vegan butter (or choose my oil-free option), roll them in cinnamon sugar and put them in an 8 x 8 or similar pan. Leave it to rest for 30 minutes then bake and frost if you want to. It’s great with or without frosting. While it bakes your house will smell wonderful, and when it emerges from the oven your mouth will be watering. It will be bubbling, sticky, sugary and delicious. It is soft, crusty and chewy all at the same time and in all of the right places. Where the balls of dough conjoin it’s super soft, the tops are slightly crusty and the underneath (my personal favourite part) is chewy and caramely. If you choose to frost it then it gets over-the-top sticky and delicious. Like seriously irresistible. 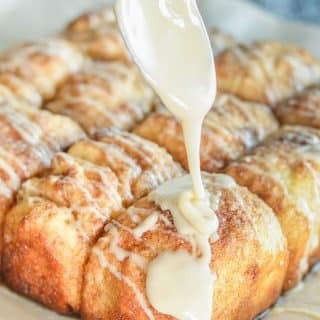 This No Knead Cinnamon Pull Apart Bread is absolutely made for sharing and enjoying with family and friends. Put it on the table in front of them and watch them tear it apart in seconds and fight over any remaining pieces. You have been warned. It will happen. It’s that good. It’s soooo sticky and delicious! Everybody loves freshly baked bread! Be prepared to wow your family and friends with this easy and incredibly delicious no-fail No Knead Cinnamon Pull Apart Bread! 240mls / 1 cup unsweetened milk of choice , it must be unsweetened as any change in the sugar content will affect how the recipe works. In a large bowl or in a stand mixer add the flour, yeast and salt. Mix them together so they are distributed evenly, then add the milk, water and maple syrup. Mix until all the flour is combined and you have a sticky dough, making sure you get right into the bottom of the bowl. Then cover with cling wrap. If you wish to leave the dough overnight or all day before baking, put it in the fridge and leave it there for anything between 8 - 10 hours. If you want to make the speedier version, you can put the bowl on the stove top or next to it and set the oven on low so that the residual heat kicks the yeast into action (make sure it isn't in direct contact with the heat though. There should just be gentle warmth. Anything more could kill the yeast). If you do this it will need to be left for 2 hours (although up to 3 will be fine). If you just leave it on the kitchen counter with no warmth from the oven you should leave it for anything between 3½-4½ hours. Once the resting time has passed, line an 8 x 8 pan (or similar, it doesn't have to be exact) with parchment paper and preheat the oven to 350°F. Melt the butter gently until liquid. Be sure it is at room temperature before you dip the dough in it or you could kill the yeast and affect how the bread turns out. Peel back the cling wrap and dust the dough with a sprinkle of flour and dust your hands too. Pull the dough away from around the edges of the bowl, then pull off chunks of dough about the size of golf balls. Roll them in your hands to neaten them up a bit although you don't have to worry about being too tidy. Dip each one into the butter, then roll in the cinnamon sugar before placing in the pan. Repeat until all the dough is gone. Make sure all the balls touch each other in the pan. They should be nestled in there snugly. If you have any leftover butter, pour it over the dough in the pan, and spoon any leftover sugar mixture over too. It will be a little sludgy because of the butter getting mixed into it but that's fine. Cover the pan loosely with cling wrap, place it on the stove top or next to it, so that the warmth from the oven preheating can reach it and leave for 30 mins. If your dough was refrigerated, leave for 50 mins. Make sure it isn't in direct contact with the heat from the oven. There should just be gentle warmth. Anything more could kill the yeast. Once it's rested place in the oven and bake for 26 minutes. It should be puffy and if you used butter, it should be bubbling around the edges. Using the edges of the parchment paper, lift the bread out of the tin and onto a cooling rack. Be careful because any drips will be very hot. Leave for 10 minutes before frosting or serving. In a small bowl, add the powdered sugar and the vanilla. Gradually add the milk, stirring as you go to work out any lumps. 6 teaspoons should be plenty. You need much less than you imagine you will. One minute it will look like there is no-where near enough milk, the next it will be ok. You need it to be thick but pourable so you can drizzle it easily. While the bread is still warm and just before serving, drizzle over the frosting. Best served while warm and on the day of baking but it can be reheated gently in a microwave after this. One piece takes around 30 - 40 seconds. For a completely oil-free option, replace the butter with aquafaba (the liquid from a can of chickpeas). If you make it this way it really needs to be served with the frosting. The milk in the frosting can be replaced with water for a truly fat-free result. Calories are calculated without frosting and using butter to make the bread. If you use aquafaba for the oil-free option, the fat and calories will be substantially reduced. If I wanted to add in chopped/grated apple, which step would I do that? just after they’re dipped in butter? That’s a good idea! I’d roll it into balls, dip and coat etc, put the balls in your pan then tuck the apple pieces between them, or you could push a piece of apple into the centre of each ball while you are forming them. Oooo I want to try this now! These were absolutely amazing. They reminded me of Miller & Paine cinnamon rolls from Nebraska when I was growing up. So easy and oh so good. My 13 year old did say there was too much cinnamon so I will make half the batch with half the cinnamon next time since I did reduce a little in my first go around. Oh, and I did do half the sugar with Sucanat Cane Sugar and it still was perfect. THANK YOU SO MUCH FOR THIS RECIPE!!! Could you replace the non-dairy butter with coconut oil? You could but I don’t think it would taste as nice. wow, this looks insanely good! Sorry, I do not understand what non-dairy butter means. Non-dairy butter is dairy-free butter or vegan butter. Basically butter made without animal’s milk. A popular brand available in most stores is Earth Balance but any variety will be fine. Thank you for the recipe, the dough and everything worked great – but the cinnamon! I cut back and just one tablespoon of cinnamon is extremely acrid and made everyone who eat them unwell, two tablespoons would be crazy. I’ve often found American recipes use cinnamon in vast amounts – so I suspect European cinnamon is a lot stronger? With the cinnamon I can buy here, I think about 1 tsp would give a strong flavor. Can these be made with a gf all purpose flour? I have never tried. I doubt it because the gluten formation is pretty crucial.I think the recipe would need adapting pretty significantly to work. Rather than risking a fail you would probably be better off finding a good gluten-free no knead bread recipe and following that to make the dough, then use my method of rolling in butter and sugar etc before cooking. If you double the recipe, do you double the yeast as well? Yes you would need to double the yeast. If you double it, it might be difficult to stir it all up with a spoon by hand. It might be easier to mix it in a stand mixer if you have one. Making these now. Is it possible to freeze some of the dough or baked cinnamon rolls? I might have made too many! I haven’t tried freezing it either before or after cooking. In theory though it should be ok to freeze the dough after the first rise in the bowl. Then defrost, roll into balls and proceed. I have frozen other bread doughs like that before and they were fine. Once they have been cooked with the butter and the cinnamon though I’m not sure how well they would freeze. They might be ok if you reheat them for a bit in the oven. I adore cinnamon rolls, but I’ve always been intimidated by the process of making them. This recipe assuages those worries entirely. This looks amazing! Ah, we love pull apart bread! Such a perfect dish for a cozy morning at home!!! This looks delicious! Thanks Sarah. It’s such a great recipe for sharing! Looks amazing, especially with the frosting! I’m a sucker for cinnamon! 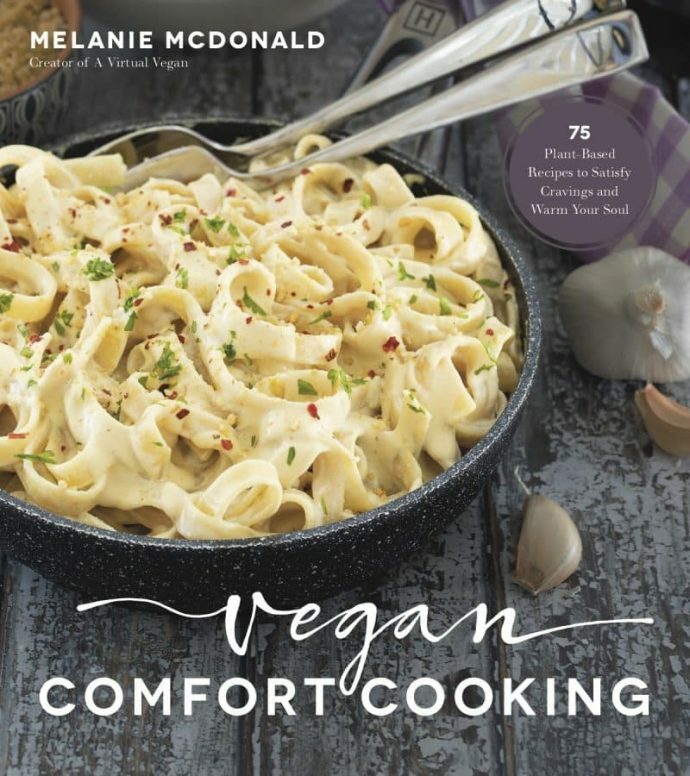 Made this for Christmas morning and it was a huge hit with vegans and non-vegans!! Thank you. Definitely going into the “will make again” file! I’m so glad you all enjoyed it! Thank you for stopping by to let me know. It’s much appreciated! We did too! It was a big hit and kept us satiated until dinner time. Making it again this morning. It’s definitely a keeper. I use coconut oil plus a little salt for 1/2 of my dipping mixture. I’d like to try it sometime 100%, but I’m chicken. Also adding some raisins this morning. 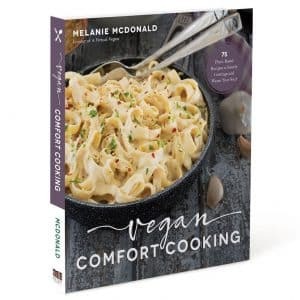 Oh, this looks so perfect for Christmas morning, Mel! I love how much easier it is than making traditional cinnamon rolls! I made these for breakfast and wow, not only it is easy to make but, it’s freaking delicious!!! Thank you for this recipe, we love it! Yay! That’s great Isabelle. I’m so glad you enjoyed it. 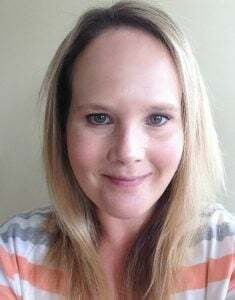 Thanks so much for taking the time to come back and let me know too. I really appreciate it! This looks so good, and I love how easy it is! And I agree, the chewy caramely bits at the bottom are the best!!! Thanks Sarah. Couldn’t be easier! Enjoy! Um, OMG, what???!!! This is basically my dream come true – EASY cinnamon rolls. I am really kicking myself that I don’t have any instant yeast and I’m not sure I want to brave the stores again this weekend…..but I might because I think it will be totally worth it for THESE!!! Ha ha! Thank you. It’s like cinnamon rolls without the rolls and so ridiculously easy. You would love it! Go get that yeast!